What Are the Most Fun Things to Do in Savannah When It Rains? With squares and streets made for strolling, it can feel like rainy days put a damper on your Savannah, Georgia, getaway. Don’t let that be the case! There are tons of things to do in Savannah when it rains, and storms can come as a nice break from the heat. From relaxing at our inn to touring historic homes, museums, and churches, you can plan a fun vacation no matter what Mother Nature has in store. Here are some of our favorite rainy day activities! Are you planning a trip to Savannah? We can help! Our complimentary Vacation Guide has everything you need to know to create your dream itinerary. Planning your vacation can be challenging and time-consuming, so we made this free guide to save you from hours of research. 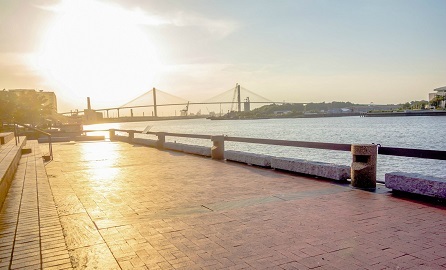 Get ideas on more things to do in Savannah when it rains, the best restaurants, outdoor activities, annual events, and more! The Ships of the Sea Maritime Museum is perfect for a rainy day. Situated in the historic William Scarbrough House, this museum houses nine exhibits of model ships, paintings, and antiques. You’ll learn about some the most important vessels in maritime history! You can spend hours learning about the past before making your way to the gift shop. 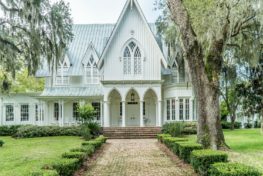 Located about 45 minutes away from Presidents’ Quarters Inn, a trip to the Rose Hill Plantation House is one of the best things to do in Savannah when it rains for two reasons: it might not be raining there and it is absolutely breathtaking. The weather in the South is finicky; 45 minutes might be all you need to get out of the rain! At this historic home, you can take a tour, then enjoy refreshments in the grand dining room. An iconic symbol of Savannah, the Cathedral of St. John the Baptist is a must-see during your stay at Presidents’ Quarters Inn. As the oldest Roman Catholic Church in Georgia, it is also one of the most beautiful. Admire the towering steeples and incredible stained-glass windows while you’re under an umbrella, then walk inside and view the impressive murals, altar, and choir area. The church is open for tours Monday through Saturday. Built in the mid-1800’s, the Andrew Low House offers the great opportunity to take a journey back in time and experience the golden era of the South. Plus, legend has it that Andrew Low’s close friend General Robert E. Lee still roams around the house! Tour the fully furnished house, learn about its past, and you might even hear the footsteps of its previous inhabitants. There’s nothing better than a little retail therapy, especially on a rainy day! Grab a souvenir to remember your trip by, a new outfit, or a gift for a loved one back home. All you’ll need is an umbrella; to get from shop to shop, you will have to go outdoors. However, the amazing shopping on River Street, Broughton Street, and the City Market make up for it! If you’re a history buff, a trip to the Harper Fowlkes House should be a top priority on your list of things to do in Savannah when it rains! This Greek Revival mansion is now owned by the Society of the Cincinnati and is filled with priceless antiques. Take a tour on Monday, Wednesday, Thursday, Friday, or Saturday from 10 a.m. to 4 p.m. to see it all! Formerly named the Roundhouse Railroad Museum, the Georgia State Railroad Museum is a National Historic Landmark that attracts thousands of visitors each year. The Central of Georgia Railway handled freight, passengers, maintenance, and manufacturing, all at this single location. Today, guests can tour the museum and even take train rides! One of our favorite things to do in Savannah when it rains is visit the Telfair Museums. This group of 3 museums contains the Telfair Academy, the Jepson Center, and the Owens-Thomas House. The Telfair Academy contains two nineteenth-century period rooms and houses 19th and 20th-century American and European art. The Jepson Center is best described as an art museum with more than 7,500 square feet of gallery space for rotating exhibitions and contemporary art. Completing the Telfair Museums trio is the spectacular Owens-Thomas House, one of the finest examples of English Regency architecture in the country! Less than a mile from our bed and breakfast is the world-famous Mercer Williams House, an 1860’s mansion that was designed by New York architect John Norris. Today, the home is a great place to relish in historic artwork and antique furnishings. We suggest taking a guided tour and visiting the gardens if weather permits. Fun Fact: Midnight in the Garden of Good and Evil was filmed in the Mercer Williams House. Don’t forget to watch the movie before you go! 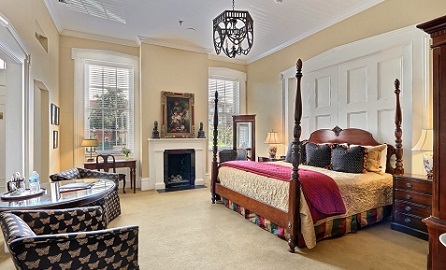 Whether you need to know things to do in Savannah when it rains or when the sun is shining, you will need a place to stay! 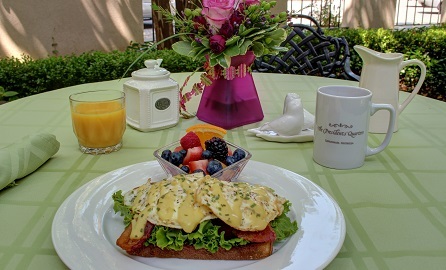 Our historic bed and breakfast offers easy access to all the activities listed above. 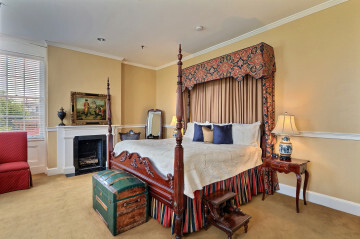 Browse through our luxurious accommodations to start planning your stay! We look forward to seeing you! Presidents’ Quarters Inn has been given permission to use the Rose Hill Mansion photo courtesy of Rose Hill Mansion. This is Why You Need to Visit the Wassaw National Wildlife Refuge — Mark Your Calendar for Savannah Restaurant Week!